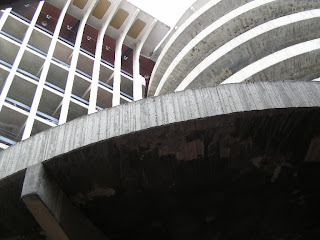 Editorials from Theslowlane: Parkade Plaza in Spokane. Can Bellingham learn from this example? Parkade Plaza in Spokane. Can Bellingham learn from this example? Every once in a while, they discuss parking garages for downtown Bellingham. If people were like me, (non drivers) parking garages wouldn't be needed. Usually folks say, "you can't build a pretty parking garage," but if parking garages can be pretty, Spokane has a good one. I got images of my favorite parking structure as I passed through Spokane, WA. on my 2007 bicycle tour. Parkade Plaza was built in 1967. I think it's 11 stories, or maybe that's to the top of the sign. Graceful concrete form. I took lower photo from Riverfront Park in 2005. See my Parkade Plaza images on Flickr. The Parkade parking facility has a capacity of 858 spaces with eight levels, designed by Mr. Heylman. The building is impressive from the vantage point within the Park. People need to loose the convenience factor in their heads, park at the Kade and walk by the shops on-the-way to the main mall meanwhile everyone parks at the other overpriced garage and impacts most of the businesses outside of the main mall area. The Parkade could use a facelift to maintain the core beauty of the building. Some upgrades have already taken place over the past summer.